This documentary by Ron Chapman profiles Arthur Fogel, a relatively unknown businessman who has revolutionized the global concert touring industry. 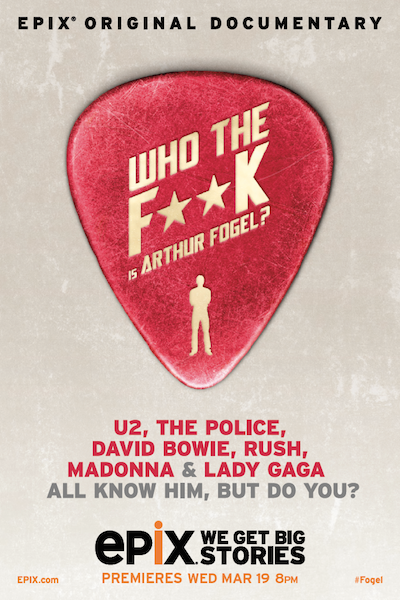 Who the F**k is Arthur Fogel? is the untold story of a quiet, private man at the controls of the high-octane, ever-changing (and often treacherous) global music industry. This documentary includes an in-depth interview with Fogel, as well as appearances by Bono, The Edge, Sting, Andy Summers, Madonna, Geddy Lee, Bill Zysblat, Monte Pittman, Kathy Schenker, Paul McGuinness, Ray Waddell, Michael Rapino, Guy Oseary, Elliot Roberts, Lady Gaga, David Bowie, Troy Carter and many many more, as well as rarely seen concert performances. In addition to the interviews, the film features the music of Lady Gaga, Madonna, Rush, Sting, The Police, U2 and Depeche Mode to name a few.